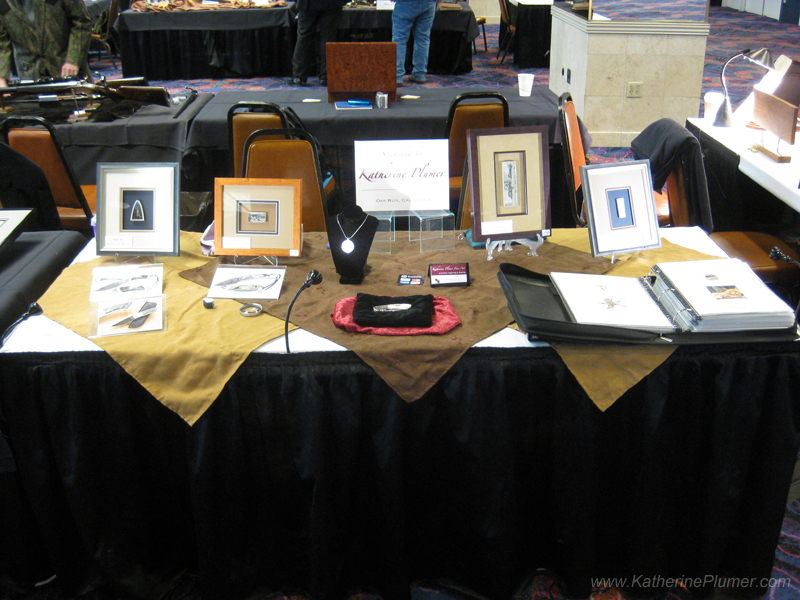 In January of 2008, I took a bus to Reno and caught the last few hours of a engraving show. I walked in knowing two people. I left with a lot of new friends. I found myself reflecting on that a lot this last weekend, what a warm and welcoming group of people that is, because I talked to so many new people who noticed the very same thing. At the time I'd been doing scrimshaw for six months. I had a few samples, but I was an absolute newbie. But I was hooked. 1) OMG I finally get to see the Greatest Generation Project all finished, in person, and OMG I finally get to meet the man who owns it and can shake his hand! 2) Holy cow I have to give a presentation. I had a lot of "what was I thinking getting into this!?" thoughts in the last week as I worked til the wee hours of the morning getting everything ready! Dang it was good to finally see everything! I got so many wonderful kind comments from so many people who I admire so much. It's hard to explain how that makes me feel. SO GOOD, so honored. And sorta like you could just knock me over with a feather, because sometimes I still feel like that same newbie who walked in there six years ago. 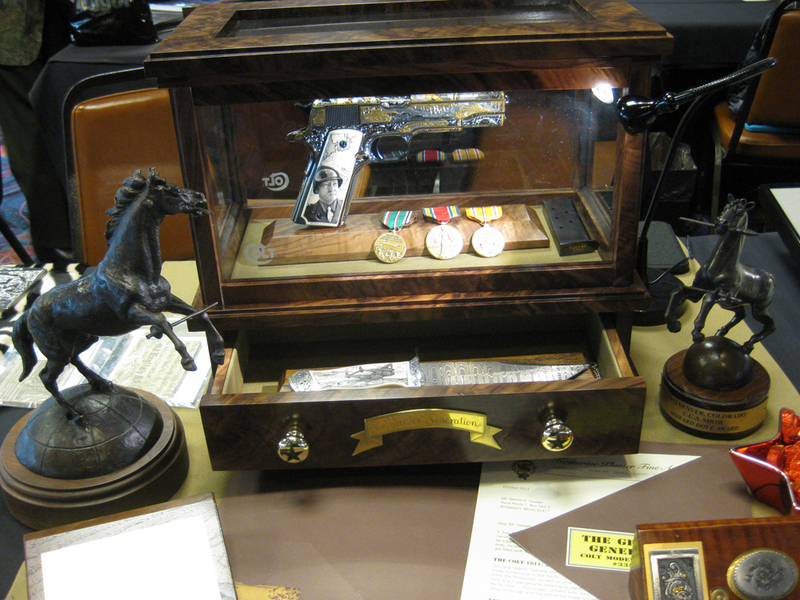 Mike Dubber, who did all the engraving on the Greatest Generation Colt 1911 and the bowie knife, won Engravers Choice, Best Engraved Handgun, and Best Metal on Metal Inlay. I am SO proud and honored to be a part of that. And the presentation, well, let's just say it was awesome. I'm feeling a little rock-star-ish at the moment. ;-) I was nervous ALL weekend, especially that morning, especially during the presentation before mine (when I found myself taking my pulse and noting that 93 bpm was a little excessive for sitting totally still), but as soon as I got up to the podium that all went away and it went REALLY well. I couldn't believe how many questions people asked me! I've still got this grin on my face and am remembering all the good times, good friends, good laughs, music, late nights, and fun travel (no bus! carpooled this year!) from the last week. Next year the show is moving to Las Vegas, a week or so earlier in January. I look forward to the change of venue, I think that will be a very good thing for publicity and bringing in more traffic. It gets pretty empty and quiet in Reno, and while it's nice to be able to leave the table and schmooze with friends, it would be better to have more business! I've never been to Vegas, but of course I'll be going! I didn't take many pictures this year. I don't like to leave my table more than necessary, I get wrapped up in my own stuff, and also I know that other friends are going around taking much better photos than I would be taking. For example, you can see Rod's photos here: https://picasaweb.google.com/rodcameron2/FEGAReno2013# Go check it out! Lots more pics of my stuff in there too. This was my table, which pretty much looked like last year's table. The coolest stuff I did was over on Mike's table, which was right next to mine. All of us in the same place at the same time, finally! :-) Mike Dubber on the left, who did the incredible engraving. 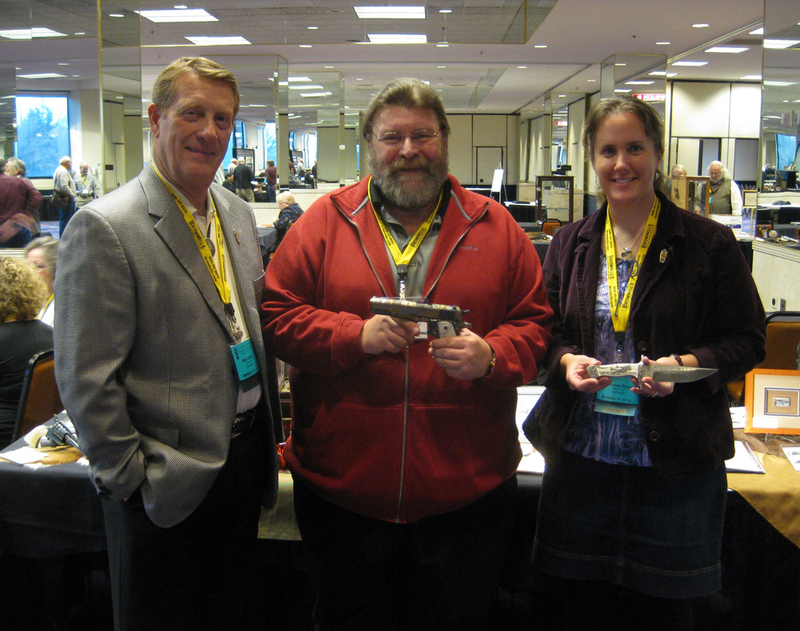 Dennis Swager in the middle, who made this whole thing possible and owns these beautiful pieces, and me on the right. So yeah, back to reality now. I do have a bunch of things in the works I'm super excited about. I'll be buried in paperwork for the next few days (sales taxes, yuck!). February is a busy month with lots of travel, and I'll tell ya more about that as it comes along! Oh! And "Thankful," the big graphite drawing of the Percheron, won Third Place at the Red Bluff Bull Sale western art show over the weekend (I was not able to attend.) And I REALLY missed all my friends down at the poultry show in Stockton. I wish I could have been there, but I wouldn't trade my weekend for anything!